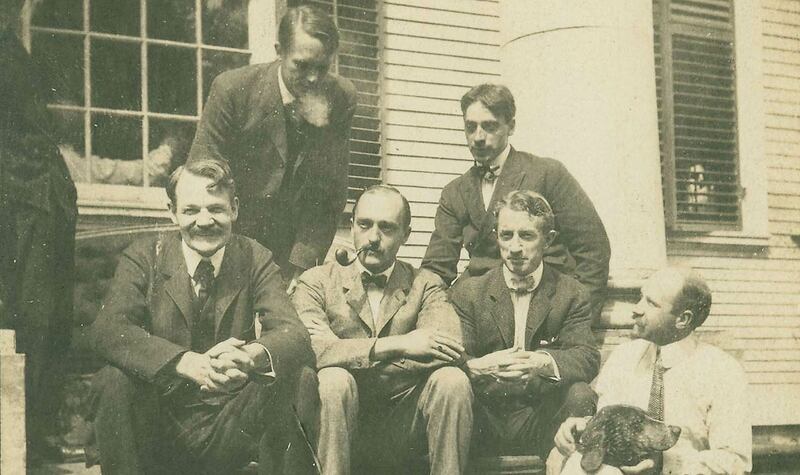 During the first two decades of the 20th century, the village of Old Lyme, Connecticut was the setting for one of the largest and most significant art colonies in America. Here was a country retreat for artists where, in Metcalf’s words, “every day is so in line with work.” Interacting with each other and with the community, the more than 200 artists of the colony produced an impressive body of work, which achieved renown in its day and still calls attention to the enduring qualities of the rural New England setting. Artists who came to Connecticut in significant numbers at the turn of the 20th century found a landscape that was intimate, rural, and soothing at a time when America was becoming urban, industrial, and restive. The themes they explored were those first seen in the aftermath of the Civil War, when an intense longing for order and stability led artists to favor quiet, peaceful views over awesome wilderness vistas. Connecticut, with its gentle, cultivated landscape and pre-Revolutionary history, became for the first time a significant place for the making of the nation’s landscape art. The American Impressionist Wilson Henry Irvine loved to paint outdoors, especially, as he noted, “when there’s a kind of haze beauty in the air.” Late Summer captures the heavy, moist atmosphere of this season in Connecticut. From its beginnings, the Lyme Art Colony was shaped by a strong group identity. Calling themselves the “School of Lyme,” the first artists who came at the urging of the colony’s founder, Henry Ward Ranger, believed they were forming a new school of painting in America. United by their shared interest in painting rural life with great sensitivity and personal feeling, these artists were identified as Tonalists. As a style, Tonalism flourished in America from the 1880s to the early 1900s and is characterized by the use of harmonious colors and delicate effects of light to create vague, suggestive moods. Just how long we will stay will depend largely upon the mosquitoes. If they do not drive me away… I would like to stay into September. Outdoor sketching was a nearly universal working method for the artists of the Lyme Art Colony. The invention of collapsible metal tubes in the 1840s allowed for long-term storage of oil paints, making extended outdoor painting possible. This technological advance would transform the practice of painting in this country. Before then, oil pigments were stored in fragile glass syringes or pouches made from pig bladders and were used principally in the studio. 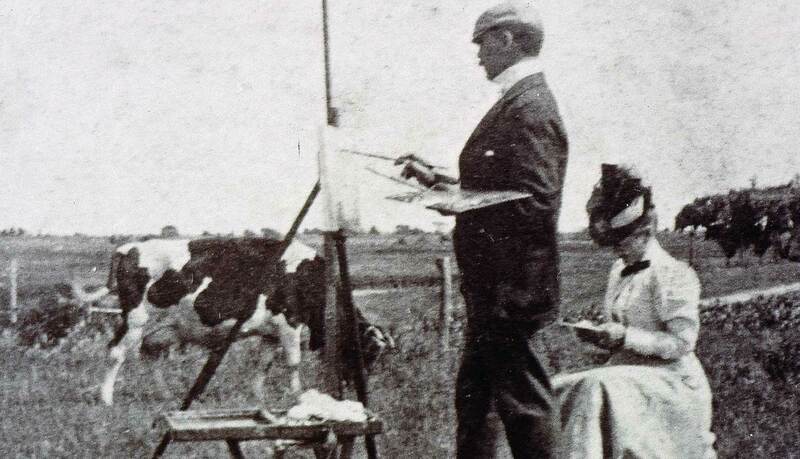 Often outfitted in country tweeds, knickers, and backpacks, the Old Lyme artists carried paint boxes filled with brushes, palettes, tubes of paint, and small canvas boards out into the open countryside to paint directly from nature. Using portable easels, and perhaps a canvas stool and sun umbrella, they painted under endlessly varying conditions and endured the distractions of both mosquitoes and curious onlookers. 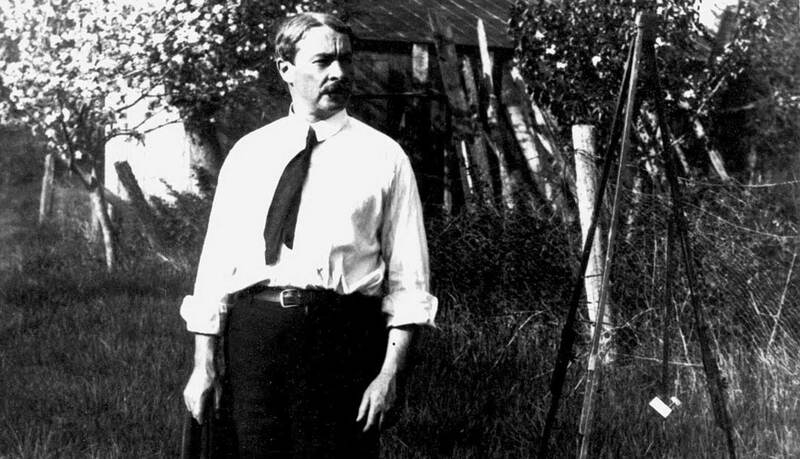 The objectives of outdoor sketching varied from artist to artist. For the Impressionist, it could yield a finished canvas, or one nearly so to be completed in the studio. 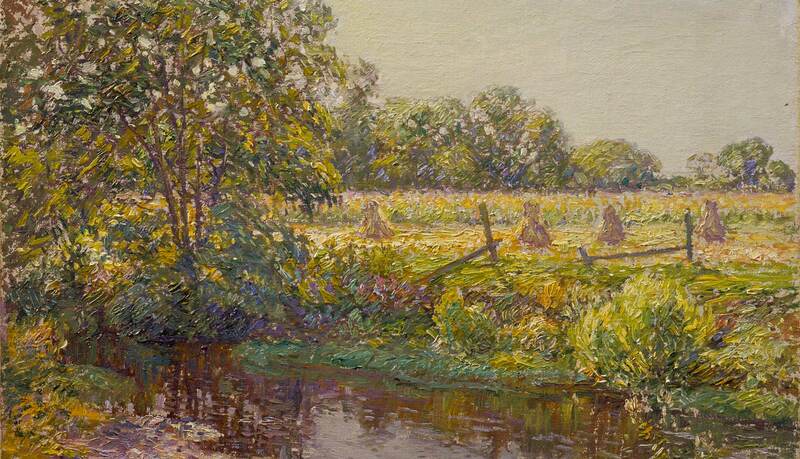 For the Tonalist, it was primarily the gathering of visual information in a sketchbook or on an oil sketch. “The object of study and sketching out of doors is to fill the memory with facts,” remarked Tonalist Bruce Crane. But for virtually all of the Lyme painters the oil sketch, usually painted on a wood panel or canvas board no larger than 12 by 16 inches, was prized for its spontaneity and freshness. Some were exchanged between artists as tokens of friendship or developed into larger works. Others were sold by Miss Florence from her downstairs center hallway. From the very beginning, painted sketches were shown along with larger oils in the colony’s local exhibitions and were popular with many patrons as affordable, and sometimes preferable, examples of an artist’s work. Although their art was informed and inspired by the works of the French Impressionists, especially that of Claude Monet and Auguste Renoir, the American Impressionists adapted their style to home ground. They freely imported the characteristics of what was once considered a radical style – the use of high-key colors and broken brushstrokes applied directly to the canvas – and adapted it to their own designs. 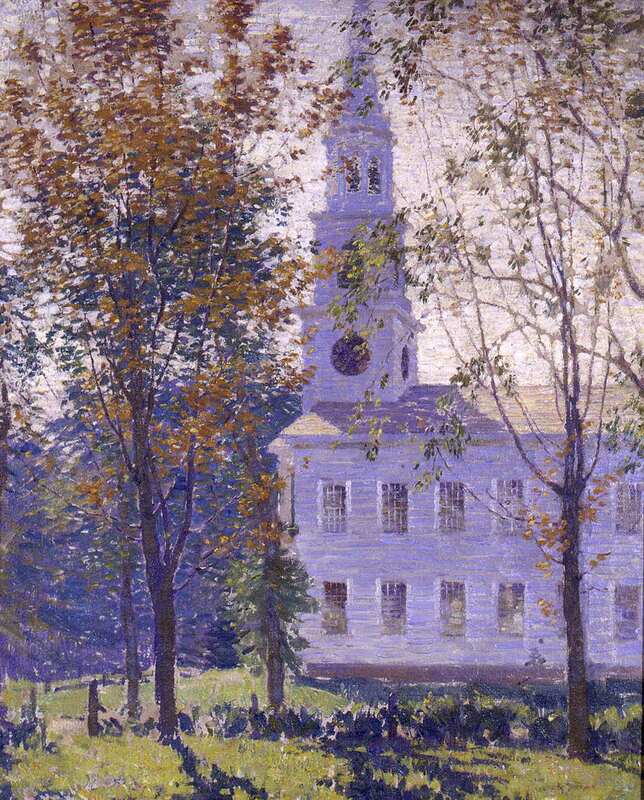 Rather than focusing on the modernity of the city as the French had done, the American Impressionists presented a fresh look at rural New England at a time when life in this country was fraught with great change and uncertainty. Just when America was poised on the edge of modernity, these painters looked backward to Old Lyme’s Colonial houses, churches, old-fashioned gardens, and well-worn landscape as evidence of a stable, timeless order far removed from the dazzle of the ephemeral. 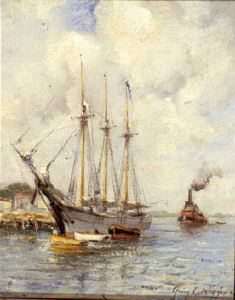 Guy was the son of the American Barbizon painter Carleton Wiggins, and he shared his father’s preference for painting in and around Old Lyme. The son, however, left images of sheep and cows to the father and looked instead at the character of the area’s landscape and shoreline. Seascape is probably a view of Mystic or Noank, Connecticut, two of the many shoreline villages that he explored, especially early in his career. This is probably an early work, since at some point he dropped his middle initial from his signature.